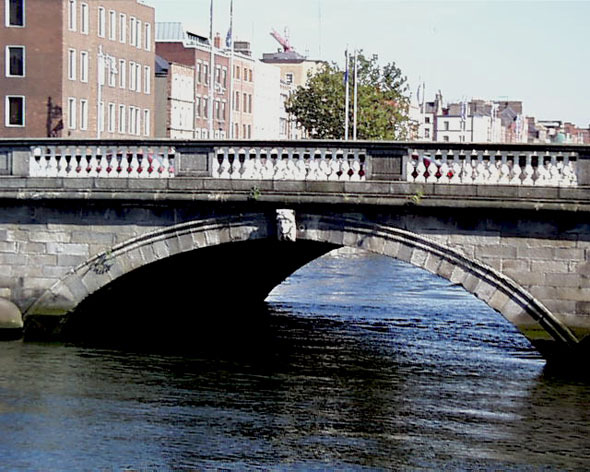 Built in 1813 and opened in 1816, this was originally known as Richmond Bridge after the Viceroy – it was later renamed after Jeremiah O’Donovan Rossa (1831-1915) a leading republican and Fenian. Constructed to replace an earlier bridge that collapses during a storm in 1803. During the building of the bridge, German, Spanish and British coins and weapons were found under the south foundation while two 18 foot long boats – one bearing a corpse were found under the north side. The bridge features keystone heads in the manner of the Custom House on each of its three arches.